This section of the CRAFT Website illustrates how CRAFT could be used with a real-life example. Each page in this section (Objectives, Model, Alternatives, Effects, and Synthesis) details the steps that would be take during the CRAFT process. Invasive exotic plants are one of the top threats to the health and integrity of forests in the United States. The area of the Pisgah National Forest surrounding Hot Springs, North Carolina has been colonized by a variety of invasive exotic species that threaten native plant communities. In this example, we highlight how forest managers and planners could use CRAFT to help find a solution concerning the invasion of Japanese Stilt grass in the Hot Springs area. 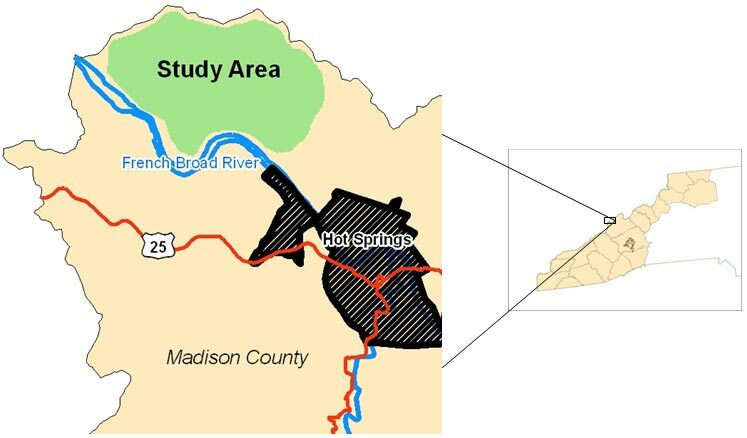 In order to keep this example small and manageable for the reader, the CRAFT project featured here focuses only on a sub-watershed near Hot Springs, NC. Additionally, we highlight the different steps of CRAFT on the right side of your screen to help you clearly see the evolution of the CRAFT process.